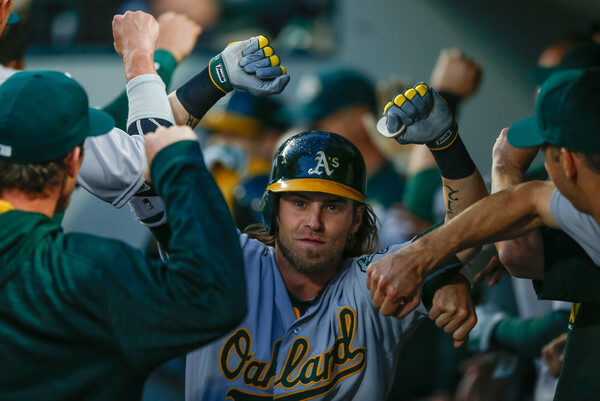 Reddick is batting .296 with eight home runs and 28 RBIs for the A’s in 68 games this season. The 29-year-old right fielder missed more than a month out of the season with a fractured thumb in his left hand. Since returning on June 28, Reddick had a .258 batting average in 27 games. Reddick bats left-handed and throws right-handed. His former A’s teammate, Dodgers pitcher Brett Anderson, said that Reddick has a big personality that would play well in the Los Angeles market. The Savannah, Georgia native is a free agent at the end of the season. Hill, 36, is on the disabled list with a blister on his left (pitching) hand. He’s eligible to be activated Thursday. Out of organized baseball a year ago, Hill signed with the Boston Red Sox in August 2015 and posted a 1.55 earned-run average in four starts. Hill signed a one-year, $6 million deal with the A’s last winter and posted a 9-3 record and a 2.25 ERA in 14 starts. Cotton, 24, was 8-5 with a 4.90 ERA in 22 games (16 starts) with Triple-A Oklahoma City this year. In July he was selected to play in the All-Star Futures Game. In five minor league seasons, he’s pitched 94 games (59 starts) with a 3.77 ERA after being selected by the Dodgers in the 20th round of the 2012 draft. Teammates raved about Cotton’s changeup, which he paired with a 95-mph fastball to limit hitters to a .194 batting average in his last 12 starts. However, he’s struggled with command in the past, particularly keeping his fastball down in the zone. Some scouts project him as a middle reliever at the major league level. Holmes, 20, went 8-4 with a 4.02 ERA in 20 games (18 starts) with Single-A Rancho Cucamonga this year. The right-hander had a 16-11 record with a 3.61 ERA in 55 games (52 starts) in three minor league seasons. He was originally selected in the first round (22nd overall) of the 2014 draft out of Conway (SC) High School. Montas, 23, has spent most of the season on the disabled list due to rib resection surgery in February. After recovering from the surgery, the right-hander posted a 2.25 ERA in seven games (four starts) with Triple-A Oklahoma City and Double-A Tulsa while touching 100 mph with his fastball. But Montas’ right ribcage pain resurfaced in June and he hasn’t pitched since. He was projected to return by mid-August. Montas appeared in seven big league games with Chicago-AL last season in his only big-league action, allowing eight runs in 15 innings. This entry was posted in Breaking news, Hot Stove, JP on the Dodgers and tagged A's, Frankie Montas, Grant Holmes, Hot stove, Jharel Cotton, Josh Reddick, Oakland, Rich Hill by J.P. Hoornstra. Bookmark the permalink.